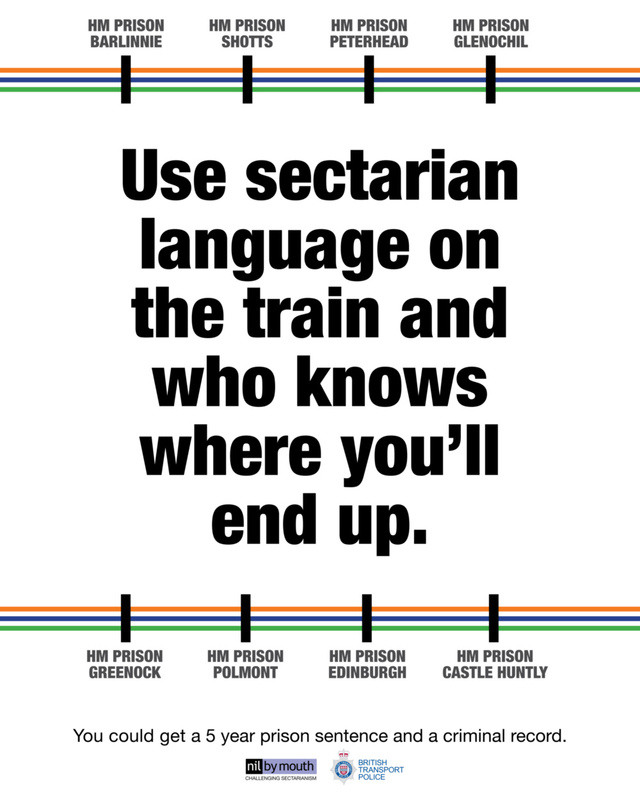 This afternoon we launched our new hard hitting nationwide campaign aimed at tackling sectarian behaviour on Scotland’s rail network at Glasgow Queen Street Station. Nil by Mouth teamed up with British Transport Police (BTP) and Scotrail to create the poster campaign which is being featured on hundreds of services across Scotland. The poster depicts a railway route map with the locations of various Scottish prisons. The wording makes it clear that sectarian behaviour on a train could result in a prison sentence. “This campaign will be a stark reminder to people that if they are chanting sectarian abuse, songs or slogans on trains they are breaking the law and risk prosecution. We are grateful to both BTP and Scotrail for their support and the campaign has already received a good reception from commuters. People are sick, sore and tired of this type of behaviour and want to see action taken to put an end to it. “It would appear that individuals are still prepared to indulge in this unsavoury and unacceptable behaviour. In addition, the BTP have introduced a new text service. Passengers can now easily report a non-emergency incident by texting 61016.